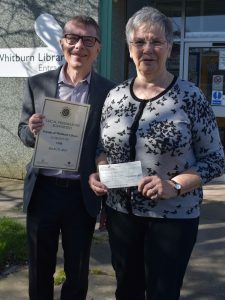 Many thanks to the Durham Benevolence Fund, who have kindly provided us with a grant to help with the building works that have taken place in the library. See below our secretary Marilyn Harding being handed a cheque from Master Carl Baker. We have been awarded £500 from the Durham Benevolence Fund, which has been matched by Hedworth Masonic Lodge which gives a total of £1000 towards the renovation works we are currently undertaking.